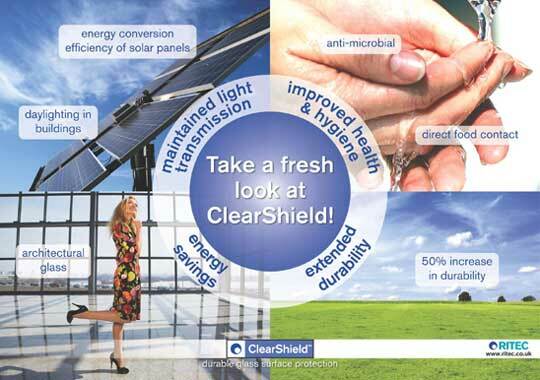 Clearshield is the name of the glass surface protection system which is produced by Ritec International in the UK. Developed over 30 years ago for the marine glass industry, Clearshield continues to evolve as emerging market sectors request a total glass surface protection system which is reliable, has stood the test of time, and which is backed up by a strong and ethical company. The collage above represents the core sectors that the Clearshield system is dominant in, but this is merely a hint of the flexibility of Clearshield. The treatment can be done in factories, or on site (during or after construction), on new glass or old contaminated glass, on clear glass or sandblasted glass, and by experts or by the DIY enthusiast. Clearshield is Green and Safe. The treatment is non-toxic once cured, and all chemicals in use have world standard safety data sheets. Whether you are an end user with glass challenges or a glass merchant looking to enhance your value offering, Clearshield is the only broad spectrum solution and opportunity in the glass surface protection industry.